Seven-year-old Gwendolyn has every material comfort a girl could wish for, from dolls and fine clothes to a grand home and a pony of her very own. But all she really wants is love, attention, and the freedom to play with other children. Neglected by her self-absorbed and society-obsessed parents, Gwendolyn is left to the indifferent care of servants. When the lonely child falls ill, she plunges into a chaotic dream world. 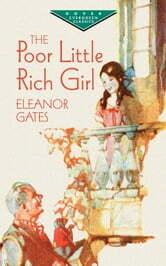 Eleanor Gates's popular play first appeared in novel form in 1912. The timeless tale of the child who has everything but what she really needs inspired film versions starring Mary Pickford and Shirley Temple, and it remains an ever-relevant reminder to parents of where their true treasure lies.